Baccarat is a French card game with Italian influences, but it’s been a popular attraction at casinos around the world for well over a century. There are three different baccarat variations, and each requires its own strategy. Thanks to online baccarat, card enthusiasts can now enjoy all three versions of the game 24/7 from the comfort of their own home. There are three popular baccarat variations: punto banco, chemin de fer and baccarat banque. While brick and mortar casinos usually choose just one baccarat variation, many online casinos offer two variations and sometimes even all three. Punto banco translates literally as player/banker, which refers to the two hands on the table, though players may also choose to wager on a tie. Punto banco is the prevailing baccarat game in casinos in the Western hemisphere. 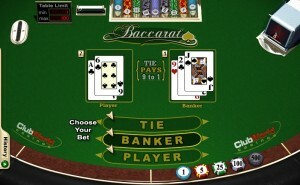 It is also the most accessible online baccarat game. Unfortunately, this style of baccarat also allows for the least strategy as the casino performs all actions for both hands based on a strict guideline for drawing cards. Chemin de fer is a reference to the railroad; this variation of baccarat earned its name for how the decks travel around the table. At least two players get to take an active role in chemin de fer baccarat, making it a great game for players that like to be part of a crowd. This is the least common variation offered – both live and online. In baccarat banque, high rollers can buy the banker position. A total of three hands are dealt, with one player hand representing each side of the table and a third hand representing the banker at the center. Drawing is done in the same style as chemin de fer. As you might have noticed, all of the baccarat variations follow a similar banker/player hand format. Some live baccarat games allow players to deal, but in online baccarat the dealing feature is always automated. Every game begins with a shuffle, and then two cards are dealt to each hand. In punto banco the cards are face up, but in the other baccarat variations the cards are dealt face down. Whether you are playing one of the hands or simply betting on one, your goal is to have that hand get closer to 9 points than the opposing hand. Unlike other card counting games like blackjack, there is no busting in baccarat. If a hand total goes over 10, then its new value is the second digit in its total. This scoring system is called modulo 10. For this reason, all numbered cards from 2-9 are worth their face value while face cards are worth 0 and an Ace is worth 1. That means that an example hand of King, 9 and 3 (0+9+2=12) would be worth 2 points. Because a 9 is the best possible score, if either hand has a starting score of 8 or 9 then that is announced, the cards are turned face up, and the better hand automatically wins. All baccarat games are dealt from a shoe comprised of several decks of cards. That makes counting cards virtually impossible, especially since those cards are shuffled prior to starting every hand. Regardless of whether the house decides if a hand takes a card or if the punters (bettors) themselves decide, no more than three cards are ever dealt to a baccarat hand and the third card is always dealt face up.